I created this for Valentine's Day. It's beautiful and delicious! It is easy to assemble right before serving as long as you have all of the parts prepared. Make your own or use store bought. If you make it, it requires an overnight draining, so make a day in advance. Good refrigerated for one week. Make in advance and chill before using. Good refrigerated for several weeks. Make in advance. Good in an airtight container at room temperature for two weeks. Set out four salad plates and prepare each plate in the following way. Place 1 T mascarpone in a mound in the center of each plate. Core and thinly slice apples into 32 slices. You won't need two full apples, but it's nice to have extra in case some slices break. 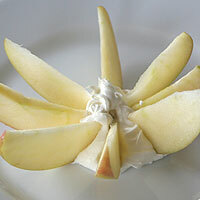 Position eight apple slices in the mascarpone by the tip, keeping the (1)peel side down. Position them circularly and an even distance apart. 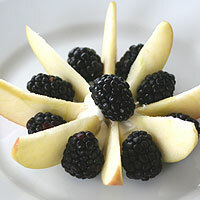 Place one berry between each apple slice and place one in the center on top of the mascarpone. Scatter 1-2 T mapled nuts on the fruit and around the plate. Drizzle with 1 1/2 t berry-balsamic drizzle. Serve (2)immediately. Preparing - Everything can be made in advance. It is easy to assemble when you have all of the parts, but if you don't, it doesn't work as a last minute fruit salad. Browning - Assemble the salad right after slicing the apples or they will brown. The acidity of the berry-balsamic drizzle will help preserve the color, so it can hold for an hour or so. I've brought the larger version pre-assembled to barbeques and the color and tastes were still great. 1. Place 1 T mascarpone in a mound in the center of the plate. 2. Core and thinly slice apples into 32 slices. You won't need two full apples, but it's nice to have extra in case some slices break. Position eight apple slices in the mascarpone standing upright by the tip. The (1)peel should be facing down. Position them circularly and an even distance apart. 3. 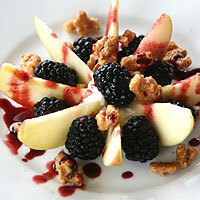 Place one berry between each apple slice and place one in the center on top of the mascarpone. Scatter 1-2 T mapled nuts on the fruit and around the plate. Drizzle with 1 1/2 t berry-balsamic drizzle. Serve (2)immediately. 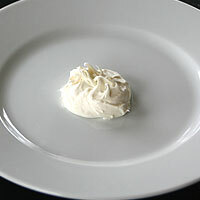 Spread mascarpone 1/8-1/4 inch thick. 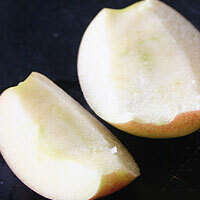 Core and thinly slice apples into 100 slices (16 slices per apple). Position each apple slice in the mascarpone standing upright by the tip. The (1)peel should be facing down. Place a berry between each slice. Drizzle with berry-balsamic drizzle. Evenly distribute nuts. Serve. 2. Heat cream over medium heat stirring constantly. When cream reaches 100 degrees add the tartaric acid. Continue to stir until mixture has reached 180 degrees. Remove from heat. Cool to room temperature. To speed the cooling process you can prepare an ice bath. Place the pan inside and stir constantly until cooled. 4. After the refrigeration remove the cheese from the cloth and place in a clean bowl. Stir vigorously until completely smooth. Cover and refrigerate up to one week. 1. Preheat oven to 250. Line a jellyroll pan with parchment or waxed paper. 2. Stir all ingredients until combined. Spread onto prepared pan. Bake 40-50 minutes until dry and crunchy. Every ten minutes during baking remove pan from oven and stir well. When they are done remove the parchment paper so the nuts won’t stick to it. 3. Cool completely and serve or store in an airtight container up to two weeks. 1. In a small saucepan boil vinegar and sugar. Reduce heat and simmer two minutes. Add berries and bring to a boil. Reduce heat and simmer 5 minutes until berries fall apart. 2. Place a fine mesh sieve over a bowl and strain mixture. Press the berries with a spoon to get all of the liquid out of them. Cool completely and serve. Refrigerate up to two weeks. 1. Positioning the apples - The apples stay upright more easily if the peel is facing down. 2. 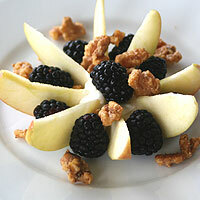 Crisp salad - For crisp apples and nuts serve immediately.